The state of Arkansas is on a mission to complete eight executions over a period of 10 days during the month of April in order to beat the clock on the expiration date for one of the three drugs involved in its lethal-injection protocol. The rushed executions have been decried for a number of reasons, not the least of which is the problems with the drug in question, midazolam, which is a sedative that is supposed to render inmates unconscious so that they don’t feel pain during the process. During several executions in which the drug was used, however, inmates were seen writhing in pain and gasping for air as they died. But there’s more to be concerned about than just a drug that is likely the very definition of cruel and unusual punishment. What about the men chosen to die? According to the report, five of the eight men suffer from a serious mental illness or intellectual impairment. One was only 20 at the time he committed his crime, had suffered a serious head injury and has an IQ of 70. Another is a paranoid schizophrenic who believes that he is on a mission from God and sees his deceased father as well as reincarnated dogs around the prison. A sixth man was burned, beaten, stabbed, raped and pimped out by his mother to various adults throughout his preteen and teen years. As for the other two inmates, there is no evidence that their attorneys ever conducted even the most basic investigation to find out if their clients had any mental illnesses or disabilities. Across the eight cases, the quality of lawyering that we detected falls short of any reasonable standard of effectiveness—one lawyer was drunk in court, while another struggled with mental illness. Several of the lawyers missed deadlines, failed to visit their clients, and continued on a case despite the appearance of a conflict of interest. Taken together, these cases present a foundational challenge to the legitimacy and integrity of the death penalty in Arkansas. The Governor should declare a moratorium on executions so these legal deficiencies can be given a closer look, or else the Courts must intervene to stop these executions in order to preserve public confidence in the rule of law. The inmates scheduled to die in the April executions are Jack Harold Jones Jr., Marcel Wayne Williams, Stacey E. Johnson, Ledell Lee, Jason F. McGehee, Kenneth Williams, Don Davis and Bruce Earl Ward. On Wednesday an Arkansas federal judge blocked McGehee’s execution, saying that the state’s rushed schedule did not allow enough time for his clemency petition to proceed. A parole board recommended that McGehee be granted clemency, but that decision will be left up to Arkansas Gov. Asa Hutchinson. U.S. District Judge D. Price Marshall Jr. said that he might also rule to delay the execution of Jones if the parole board approves his clemency petition Friday. The parole board had heard clemency bids from four other inmates scheduled to die but did not recommend that they be granted mercy, and Marshall ruled that those executions would continue as planned. Williams grew up in crushing poverty and was the victim of sexual abuse by the time he was 8 or 9 years old. His mother pimped him out to various adults as a sexual partner so the family could have some place to live. On top of that, she viciously abused him and beat him “almost every day.” On hearing this evidence, a federal judge reversed Marcel’s death sentence, but the federal appellate court reinstituted it. He is scheduled to die April 24. His execution is set for April 17. Williams was just 20 years old at the time he committed his crime, and he has an IQ of 70, which is within the intellectual-disability range. He is also believed to have suffered brain damage. He entered the juvenile correctional system at the age of 9. He will die April 27. Jones suffers from bipolar disorder and depression, and his mental illness symptoms date back to his childhood. He attempted suicide in 1989 and again in 1991, and just months prior to committing his crime, he committed himself to a mental hospital in Little Rock, Ark., for severe depression and repeated suicide ideation. The jury heard none of this evidence during his trial. He will be put to death April 24. Davis has been on death row for more than 25 years, and he, too, has intellectual disabilities. On two separate IQ tests, he scored a 69 and a 77, both of which fall within the intellectual-disability range. Unfortunately, Don Davis has never received a comprehensive mental health evaluation by an independent expert. One state-appointed expert examined Don for seventy minutes and reviewed no records. According to a hospital employee there, the hospital “did not believe” that things like “child abuse or neglect” qualified as mitigating factors. Though legal opinions make clear that both of his parents abandoned him soon after his birth, and they also reference psychological trauma as a child, the absence of a basic mitigation investigation means that the full extent of his impairments will likely never be known. Davis is set to die April 17. Lee’s case is a mess of poor legal representation and outright legal neglect. Ledell Lee has received inadequate representation at every stage of his case. Ledell’s trial attorneys filed a motion with the Arkansas Supreme Court citing an “intolerable conflict between [counsel]” and Ledell. One attorney described it as the “most gross case of [a] conflict in [his] 20 years of practice.” The state, through the Attorney General, sided with defense counsel. But the judge refused to remove Lee’s trial counsel from the case. And that is just the beginning. In June 2016, one of his federal habeas lawyers voluntarily surrendered his legal license “to prevent possible harm to clients” because he was suffering from bipolar disorder with psychotic features and anxiety. Ledell is scheduled to die April 20. We were able to find little information about Stacey Johnson’s background. We seriously doubt that this is because no such mitigation evidence exists. We found no evidence that his lawyers ever conducted a thorough life history investigation, a basic staple of effective representation in a death penalty case. Johnson’s guilt in the case is uncertain because the jury convicted him on the strength of the identification of a 6-year-old who had been told by both the district attorney and her grandmother that it was up to her to put Johnson in jail. Johnson’s execution is scheduled for April 20. 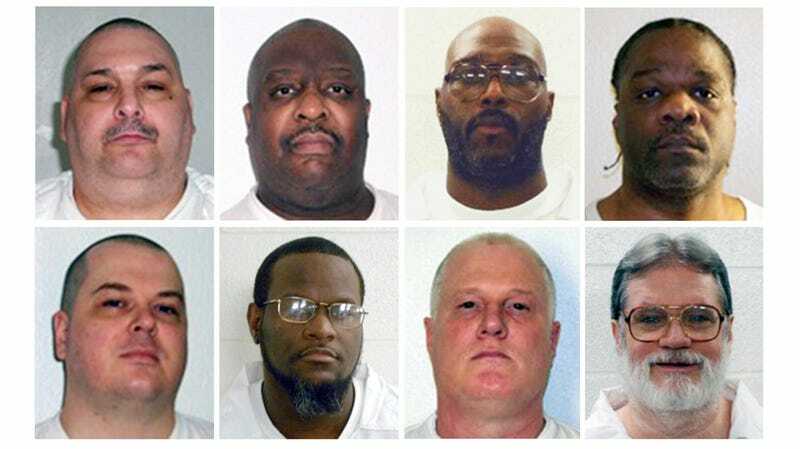 The Eighth Amendment says that capital punishment “must be limited to those offenders ... whose extreme culpability makes them the most deserving of execution.” The Fair Punishment Project concludes that in the cases of the eight men who are scheduled to die in Arkansas, that standard has not been met. Read more at the Fair Punishment Project. News Editor for The Root. I said what I said. Period.